Gemstone Size: 7x5mm. Fire Blue Opal. Blue Sapphire. London Blue Topaz. Main Stone: London Blue Topaz. Yellow Gold. Sky Blue Topaz. Swiss Blue Topaz. 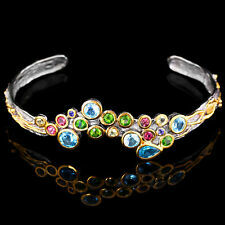 This is a beautiful bangle bracelet with gemstones and diamonds that can be worn for any occasion. 6mm London Blue Topaz, 2 Carats. Solid. 925 Sterling Silver. Matching Earrings, Pendant & Ring Available. Metal: Sterling SilverStyle: BangleLength: 7 - 7.49"
Solid. 925 Sterling Silver with 14Kt Yellow Gold Plating. 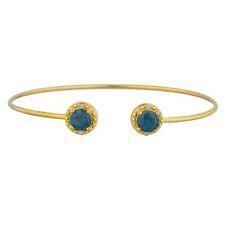 This is a beautiful bangle bracelet with gemstones and diamonds that can be worn for any occasion. 6mm London Blue Topaz, 2 Carats. Matching Earrings, Pendant & Ring Available. Style: BangleLength: 7 - 7.49"
From United StatesMetal: Rose GoldStyle: BangleLength: 7 - 7.49"
Solid. 925 Sterling Silver with 14Kt Rose Gold Plating. This is a beautiful bangle bracelet with gemstones and diamonds that can be worn for any occasion. 6mm London Blue Topaz, 2 Carats. Matching Earrings, Pendant & Ring Available. Gorgeous London Blue Topaz Woman's Wedding bangle Silver Bracelet 7.25 "
Gem Stone : Natural London Blue Topaz. Unit of item: 1 Piece. Others: Elegant, simple and beautiful! This is a beautiful oval bezel bangle bracelet design. This is the perfect gift and can be worn for any occasion. Oval Shape: 8x6mm London Blue Topaz. Oval Shape: 8x6mm Pink Sapphire. Solid. 925 Sterling Silver. Other Stones: Diamond accents 3 between each Blue topaz. Stones: 5 4x5mm oval London Blue topaz, 12 genuine Diamonds. Length: 7" wrist approx. TOPAZ ORIGIN: Natural. TOPAZ COLOR: Blue. TOPAZ WEIGHT: 16.40 carats. TOPAZ SHAPE: Round, Square. This is a beautiful pear shape bezel bangle bracelet that can be worn for any occasion. Solid. 925 Sterling Silver with 14Kt Yellow Gold Plating. Pear Shape: 8x5mm London Blue Topaz, 2 Carats. This is a beautiful heart shape bezel bangle bracelet that can be worn for any occasion. Heart Shape: 6mm London Blue Topaz. Heart Shape: 6mm Pink Sapphire. Solid. 925 Sterling Silver. Matching Earrings, Pendant & Ring Available. Solid. 925 Sterling Silver with 14Kt Rose Gold Plating. This is a beautiful heart shape bezel bangle bracelet that can be worn for any occasion. Heart Shape: 6mm London Blue Topaz. Heart Shape: 6mm Pink Sapphire. This is a beautiful bangle bracelet that can be worn for any occasion. 6mm London Blue Topaz, 1 Carat. 6mm Pink Sapphire, 1 Carat. Solid. 925 Sterling Silver. This is a beautiful round shape bezel bangle bracelet that can be worn for any occasion. Round Shape: 6mm London Blue Topaz. Round Shape: 6mm Pink Sapphire. Solid. 925 Sterling Silver. Matching Earrings, Pendant & Ring Available. This is a beautiful pear bezel bangle bracelet design. This is the perfect gift and can be worn for any occasion. Pear Shape: 8x5mm London Blue Topaz. Pear Shape: 8x5mm Pink Sapphire. Solid. 925 Sterling Silver. Solid. 925 Sterling Silver with 14Kt Rose Gold Plating. This is a beautiful oval bezel bangle bracelet design. This is the perfect gift and can be worn for any occasion. Oval Shape: 8x6mm London Blue Topaz. Solid. 925 Sterling Silver with 14Kt Yellow Gold Plating. This is a beautiful heart shape bezel bangle bracelet that can be worn for any occasion. Heart Shape: 6mm London Blue Topaz. Heart Shape: 6mm Pink Sapphire. Solid. 925 Sterling Silver with 14Kt Yellow Gold Plating. This is a beautiful round shape bezel bangle bracelet that can be worn for any occasion. Round Shape: 6mm London Blue Topaz. Round Shape: 6mm Pink Sapphire. This is a beautiful pear shape bezel bangle bracelet that can be worn for any occasion. Solid. 925 Sterling Silver with 14Kt Rose Gold Plating. Pear Shape: 8x5mm London Blue Topaz, 2 Carats. Solid. 925 Sterling Silver with 14Kt Rose Gold Plating. This is a beautiful round shape bezel bangle bracelet that can be worn for any occasion. Round Shape: 6mm London Blue Topaz. Round Shape: 6mm Pink Sapphire. Solid. 925 Sterling Silver with 14Kt Yellow Gold Plating. This is a beautiful oval bezel bangle bracelet design. This is the perfect gift and can be worn for any occasion. Oval Shape: 8x6mm London Blue Topaz. Toglette bangle bracelet featuring a london blue topaz center stone with pavé diamonds set in sterling silver. Very impressive quality solid 925 sterling silver 18k gold plated genuine london blue topaz rigid and wider styled dress wear bangle. A sought after natural blue stone in a superb designer piece. A very well made item, made with good quality of silver and to a high standard. Metal: Sterling SilverStyle: BangleLength: Less than 7"